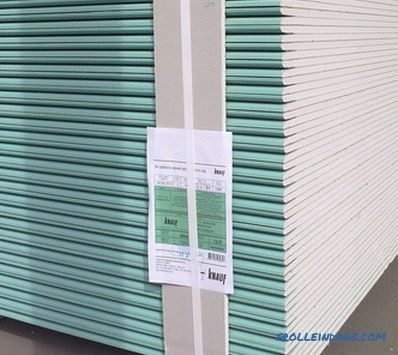 Going into the building materials store, you can see plasterboard sheets of various brands and for various purposes. An inexperienced developer is difficult to navigate in all this diversity. That is why it is necessary to know and understand the technical characteristics of drywall. From this article you will get maximum information about the characteristics and properties of plasterboard sheets of all brands and purposes. If there is a repair somewhere, then it can be said with certainty that gypsum cardboard is definitely one of the building materials. It is very popular and in demand, as it is excellent for decorating apartments and houses. This material is inexpensive, completely harmless and non-flammable, it has good sound insulation properties. It can take away excess moisture from the air, and then easily give it away if the air dries. Working with drywall is pleasant and easy - it is not capricious and just processed. Builders especially like the lightness of plasterboard sheets - this is a big plus both during installation and during transportation. When working with drywall, there is little waste, and garbage collection is much faster. 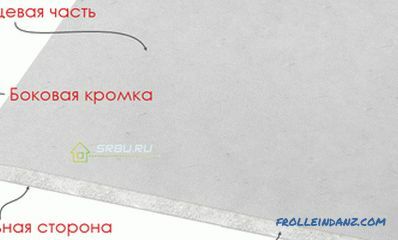 Application in the construction of drywall - the so-called "dry construction". 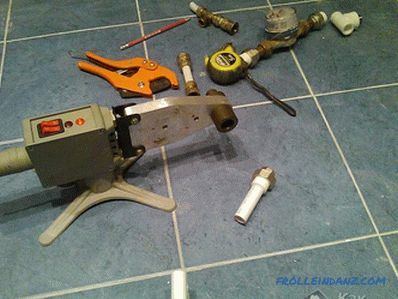 It is very convenient that a special tool is not needed for drywall - the minimum that is available in every home is enough. Complex designs of this material may be created due to its special properties. It is enough to wet a drywall sheet, and you can do anything with it. For example, bend it in the form of an arch, build a niche or implement an intricate design project. After drying, the design will retain its shape. By the way, smooth surfaces are also excellent. Thanks to the use of drywall, the time spent on finishing work can be significantly reduced. Take, for example, the manufacture of partitions. If you make it from traditional building materials (say, bricks), you will have to spend three times more time. And drywall does not cause allergic reactions, which is also a positive quality. Unfortunately, there are properties and characteristics of drywall that do not add to its advantages. Thus, the strength and water resistance of this material can not boast. In addition, it is difficult to attach anything to it. It is useless to make holes in the drywall wall with nails - only dowels with screws can hold a shelf or a picture on them. 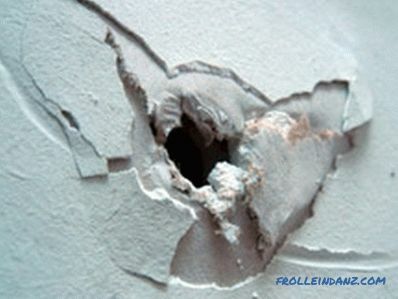 But still, nothing particularly hard to hang is not worth it, as this can lead to the complete destruction of the wall. Nothing complicated - the design corresponds to the name. The core of plaster with additives, and outside - cardboard lining. She holds tight special glue. Depending on the application, various types of drywall are available. 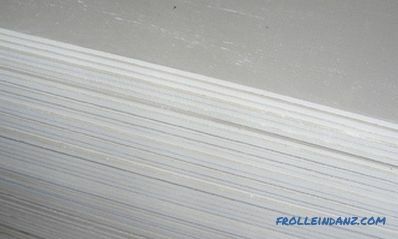 Sheets can be 2.3 or 2.5 m long The width of any of them is 1.2 m. The thickness of this material is 12.5 mm, its color is gray. On the cardboard in blue marked marking. There are no special additives in the core, the material properties are standard. The length of the sheets can be 2 or 2.5 m, and the width - 1.2 m. The thickness is less than that of the wall material - it is equal to 9.5 mm. Light gray cardboard cladding is similarly marked in blue. 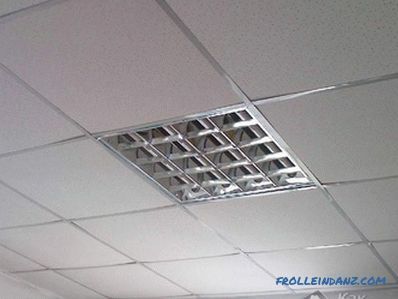 This type of gypsum plasterboard is used for ceiling lining, as well as for the manufacture of niches, arches and multi-level ceiling structures. The properties are similar to the previous form, differing from it only in thickness. Because of this, he, by the way, is the cheapest. Sheets 2.3 and 2.5 m long have a standard width of 1.2 m. The thickness is the same like wall material (12.5 mm). Facing cardboard is green, marking it is blue. Apply data GKL in rooms with excessive humidity, which they easily tolerate. It is possible to improve this characteristic of moisture-resistant drywall, if you additionally cover the walls with waterproofing material. Also in this quality can serve as a paint, primer or tile layer. This material and the core, and cardboard have a special composition, so they are not afraid of moisture. Antifungal impregnation and special additives are used for this. The length of its sheets can be 2, 3 and 2.5 m, and the width and thickness of ordinary - 1.2 m and 12.5 mm. Facing cardboard has a light gray color, and all designations on it are red.Use data GKL where the requirements for fire safety are high. For example, it may be a chimney or fireplace trim. Such a drywall in the core has a large number of fibers and additives intended for reinforcement. This construction, reinforced by the outer cardboard lining, is hard to overcome. After all, it turns out like a double frame. Note that durable cardboard, used in any GCR, does not burn and does not contribute to burning. Maximum - he charred. But the core is able to resist fire only in a fire-resistant type of drywall. In case of fire, it does not collapse and retains its shape. Combines the properties of moisture-resistant and fire-resistant plasterboard. Its light gray sheets have only one length - 3 m. The width, as usual, is 1.2 m. But the thickness of the material is small - only 6.5 mm, so basically it is mounted in two layers. Arched drywall make various products of a curved shape with a different bend radius. It is so easy to bend them thanks to fiberglass filaments that strengthen the core. However, due to this, the price of sheets is quite high. And the fact that they have to put a double layer, further increases costs. 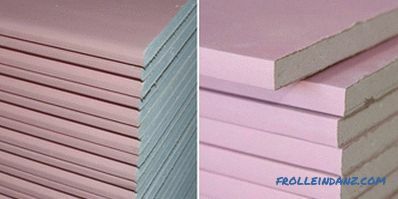 There are two quality categories for rectangular gypsum plasterboard sheets - “A” and B. ”The last one allows for some errors in geometrical dimensions. The equipment is old-fashioned. However, the main the mass of manufacturers produces drywall only "A" category, so they do not consider it necessary to indicate this in the characteristics. But you need to know about it. The standard width of sheets is 1.2 m. They are made in accordance with GOST 6266-97: inside two layers of durable cardboard The hardened mass of gypsum with special additives for reinforcement is provided.The lateral, longitudinal sides of the sheet are wrapped in cardboard. 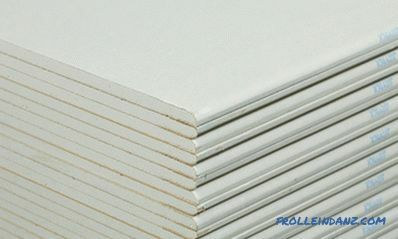 There are several types of edges used in the production of gypsum cardboard. This is done for more convenient processing of the joints between the sheets. It is worth remembering that all the faces of the gypsum boards are always only rectangular. PC (straight edge) is used when joints are not to be sealed. CC (edge ​​with thinning) is needed if reinforcing tape and putty are used for sealing. PLC (front semicircular edge) is used when working with putty and the absence of reinforcing tape. PLUK (semi-circular front edge with thinning) can be used when working with putty and with reinforcing tape and without this tape . LC (rounded edge) is used if the joints are to be sealed with plaster. This characteristic is determined by the minimum load at which the gypsum board is able to collapse. The calculation is carried out in kilograms. 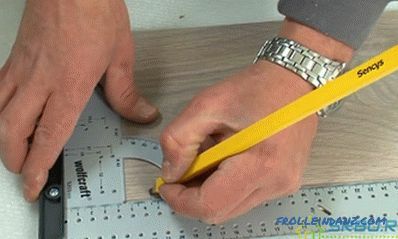 For testing, a sample is taken with a width of 40 cm and tested on supports, the distance between which is 40 times greater than the thickness of the sheet. Minimum load for a drywall 10 mm thick sheet. makes 15 kg. Minimum load for a sheet of plasterboard with a thickness of 11 - 18 mm. makes 18 kg. Drywall is not a combustible material, and besides, it can withstand fire for a long time. As a matter of fact, any gypsum-containing materials can boast of such qualities. GOST 12. 1. 044 determines toxicity, drywall refers to the group - T1. In case of fire, the characteristics of fire-resistant drywall allow it to stand firmly against fire. The gypsum itself cannot burn, and after the destruction of the cardboard, the core simply crumbles. To increase the fire resistance, partitions are made of two sheets of drywall. So the cardboard between two sheets is able to resist fire for a longer time. All the negative temperatures that are possible in nature are good for drywall sheets. Neither their destruction nor fatal changes in physical properties occur. As soon as the temperature rises, the sheet is fully restored. GCR feel best at room temperature - after all, they were created for interior work. For drywall grades with moisture resistance (including those that are also fire resistant) moisture absorption is not more than 10 percent. There is a drywall and another important parameter - the softening coefficient Kp, which is calculated by dividing the tensile strength in a water-saturated state (Rn) by the tensile strength in dry form (Rc). If we talk about sheets of ordinary gypsum board, then their strength with strong wetting is significantly reduced. These materials sell quite a lot, and they all have a small softening coefficient, equal to about 0.8. But the GCR has a slightly different value of this parameter - 0.45. 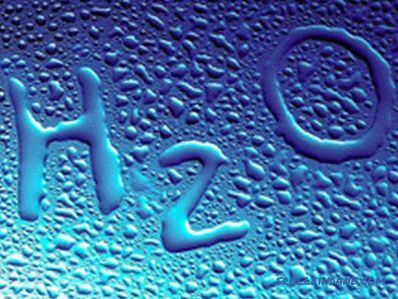 This means that after wetting, the strength of this material will greatly decrease. To begin with, it should be noted that drywall retains heat quite well. The coefficient of thermal conductivity in drywall is from 0.22 to 0.35 W / (m * K). This is not bad - after all, when carrying out repairs, you can immediately make the walls even and somewhat improve their thermal insulation. It should be noted that this method of wall insulation is inexpensive, fast and efficient. And if you make a gap of 3 to 10 mm, then there will be an additional air layer, which helps to preserve heat even better. 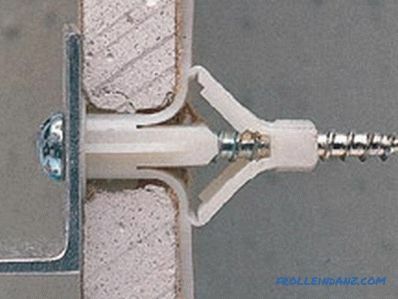 In order to achieve a good thermal conductivity result, various insulators are placed into the cavity between the insulated wall and the drywall. This may be, for example, mineral wool or ordinary foam. The further we move the plasterboard from the wall, the thicker you can make an additional insulation layer. If we want to hang a shelf or cabinet on a drywall wall, we must remember that the load should not exceed 30 kg per square meter. How much does one square meter weigh? Sheets of GKLV and GKL type weigh no more than 1 s (kilograms per square meter). Fire resistant sheets - not less than 0.8 and not more than 1.06 s (kilograms per square meter). Drywall, which is sold in stores and on the market, can most often be 6, 9, 12 mm thick. The thinnest gypsum plasterboards, having a thickness of 6 mm, are used for the "wet method" - they make complex curvilinear products (arches, design structures, niches). The thickness of 9 mm is well suited for bending sheets in a "dry way" and creating the same arches - experienced craftsmen usually do so. Another of the 9 mm gypsum ceiling made to reduce the weight of the structure. The thickest sheets are used for wall cladding and creating partitions. Other sizes are rarely available for sale, and therefore, as a rule, they do not interest the average buyer. production standard - GOST 6266-97 . For example, take a plasterboard sheet of group "A" from the company Knauf. 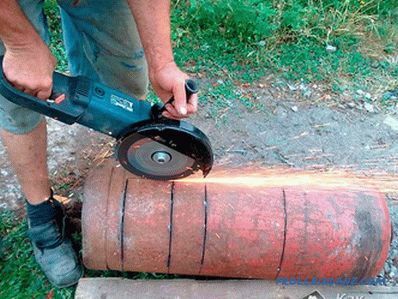 Its length is 2500 mm, the width is standard, the edge is semicircular, thickness is 9 mm. FCL - A - PC - 9 * 1200 * 2500 GOST 6266-97. GCR - PC - 9 * 1200 * 2500 GOST 6266-97.